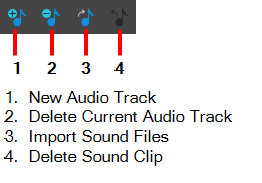 The Sound toolbar lets you import sound clips (.wav, .aif, .aiff, or .mp3) into an audio track at the first frame or at the current frame. If the sound clip does not already exist in your project, Storyboard Pro copies the file from its present location to the audio folder in your storyboard project folder. You must work in the Timeline view.MP3 files are not recommended for long sequences because it is a compressed file format. For optimal results, use .wav or .aif sound files when working on a long sequence. Adds a new audio track to the Timeline view. Deletes the currently selected audio track and its sounds. Deletes the selected sound clip.